Dr. Ursula Yvette Scott (Dr. Yvette) is an award-winning educator and businesswoman whose work in both the public and private sectors has changed countless lives over her 20-year career. Are you interested in how to create a standout author website that will impress clients, get you hired for speaking engagements and sell more books? You know you need one. Without a website, it’s like you’re invisible. Having a website improves your credibility, especially when trying to grow your engagement online. Architechs for the Web had the privilege to work with Dr. Ursula Yvette Scott (Dr. Yvette). Dr. Yvette is an award-winning educator and businesswoman whose work in both the public and private sectors has changed countless lives over her 20-year career. Dr. Yvette has been writing, mentoring, and empowering people (particularly women) her entire adult life. She is founder of Yvette & Company, CEO of 31st & Seventh Media, and Executive Director of PATHS, a learner support and tutoring program for students. Create a clean, uncluttered design. Create clear call to actions. Quickly portray the type of writing she does. Website elements are presented in a way that’s easy to read. 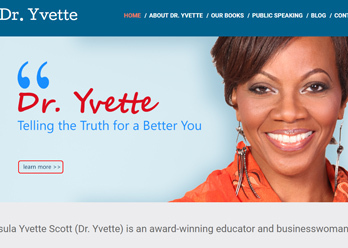 In addition, Dr. Yvette's website offers a full screen, mobile responsive design featuring a persistent site navigation. If you have not had the opportunity to view her website, please do so by visiting http://www.dryvette.com .